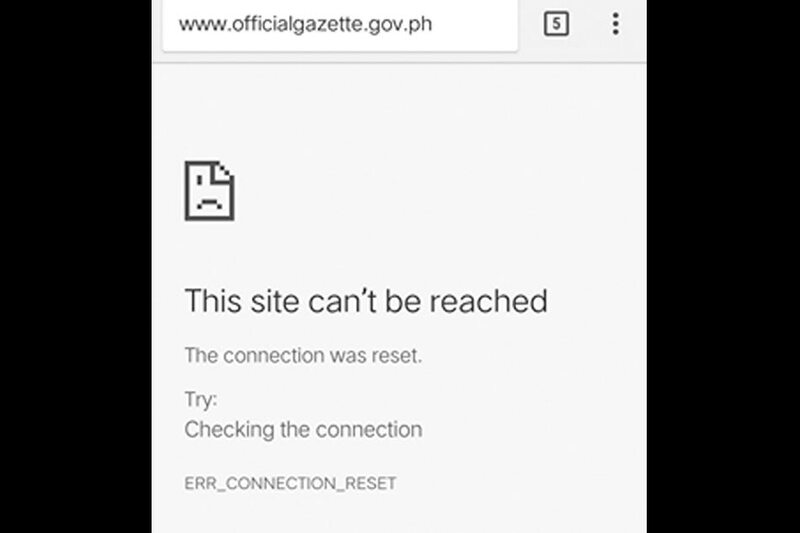 MANILA - Around 170 government websites were down on Tuesday due to server malfunction, the Department of Information and Communications Technology (DICT) said. DICT officer-in-charge Eliseo Rio Jr. said signs of malfunction were detected early Monday morning and that server issues caused by a hardware problem were still being fixed. He said the DICT has sought the help of multinational tech company IBM to bring the servers back online this week. Rio said the servers may need some upgrades because the government has been using them for more than 6 years. Among those affected were the government's official online gazette and websites of the DICT, the Department of Health and the Department of Science and Technology. Infrastructure Management Bureau Assistant Secretary Allan Silor said the sites were not hacked and that physical and cyber security remains "intact." While he did not disclose any further information on the hardware issue, he described it as a "storage problem." He said he could not verify exactly how many government websites were down but a compete inventory of the affected sites would be prepared within the day. The websites may only be restored "prior to the end of the week," said Silor, as he noted the need to review the hardware issue. If any hardware needs to be replaced, government procurement protocol must be followed.